Newswise, June 30, 2016 — (PHILADELPHIA) -- About 5.7 million Americans have heart failure, half of whom will die from the disease within 5 years, according to the Centers for Disease Control and Prevention (CDC). Two processes help drive the disease: a weakened heart muscle that is less able to pump, and the death of heart cells that irreparably damage the heart. Beta-blockers, commonly used to treat heart disease, work by blocking the beta-adrenergic receptors in the heart, saving heart cells from cell death. But beta-adrenergic receptors also help keep the heart pumping, a function that this medication also blocks. Now, Jefferson researchers have discovered how to bypass this problem by tapping an alternate pathway that both blocks damage to the heart and helps it keep pumping. The research, published online this week in theProceedings of the National Academy of Sciences USA (PNAS) offers the possibility of developing a new, and potentially more effective, class of heart-failure medications. “There’s much more work to be done before this is ready for patients, but this is an excellent example of how a little curiosity in the basic research laboratory can lead to discoveries that have the potential to change the way we treat a very common and very deadly illness,” said senior author Jeffrey Benovic, Ph.D., Thomas Eakins Professor and Chair of the Department of Biochemistry and Molecular Biology at the Sidney Kimmel Medical College and Associate Director at the Sidney Kimmel Cancer Center at Thomas Jefferson University. Of the beta-adrenergic receptors present in the heart, it is the beta1-adrenergic receptors that are primarily responsible for the heart’s contraction, or pumping action, and that are targeted by traditional beta-blockers. Dr. Benovic’s lab, however, had developed a series of molecules called pepducins that were derived from pieces of the beta2-adrenergic receptor, and which, they discovered, could selectively activate the very receptor they came from. It was while former graduate student Richard Carr, in Dr. Benovic’s lab, was characterizing the properties of these pepducins that he noticed that the molecule shared similar characteristics to a common heart-failure medication called carvedilol. They sent the pepducin to their colleague Dr. Douglas Tilley, Ph.D., at Temple University who tested how heart cells responded to the molecule. “He was blown away by what he saw,” said Dr. Benovic. When Dr. Tilley pulsed the heart cells with the pepducin, the cells started to beat more forcefully. “We didn’t expect that this would happen,” said Dr. Benovic. The pepducin they were using was specific for the beta2-adrenergic receptor pathway, and didn’t have any effect on the beta1 receptors. The researchers had demonstrated for the first time that contraction of heart muscle cells could be triggered via the beta2-adrenergic receptor, using this novel pepducin. 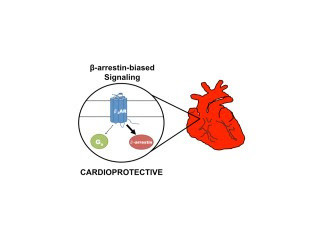 Through further biochemical analysis the researchers showed that the pepducin activated the ability of the beta2-adrenergic receptor to interact with a secondary signaling molecule called beta-arrestin and that it was this interaction that promoted the heart cells to beat. The next steps, said Dr. Benovic, are to design a better version of the pepducin. In addition, Dr. Benovic and colleagues plan to screen existing small molecules, or drugs, to see if one can mimic the action of the pepducin. They also plan to study the structure of the pepducin and the beta2 receptors to gain better insight into the design of more effective pepducin-like molecules.